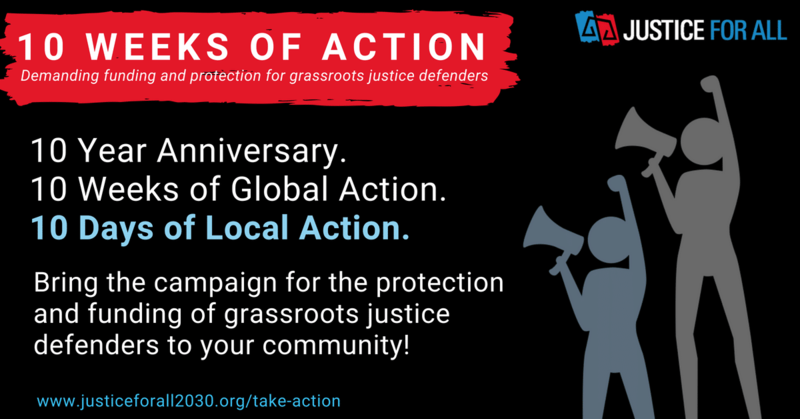 This post is part of 10 Weeks of Action: Demanding funding and protection for grassroots justice defenders by calling on our community to sign the #JusticeForAll petition. Each week, we will spotlight how access to justice is critical to the advancement of different thematic issues. Over the past 10 weeks, our community has come together to demand greater funding and protection for grassroots justice defenders by signing the #JusticeForAll petition to be delivered to world leaders. On September 25, 2018, world leaders and grassroots justice defenders will mark the 10th anniversary of the Commission on Legal Empowerment of the Poor, established at the United Nations in 2008. The Commission consisted of a group of high-level thought leaders and access to justice practitioners who researched and assessed the global justice gap and came up with recommendations on the way forward. The group published a report entitled, Making the Law Work for Everyone, which examined the global justice gap and estimated that 4 billion people around the world live outside of access to justice. The anniversary will be celebrated alongside The 73rd Session of the UN General Assembly in New York, an annual moment where heads of state come together to the world’s most pressing issues. This presents us with a unique opportunity. 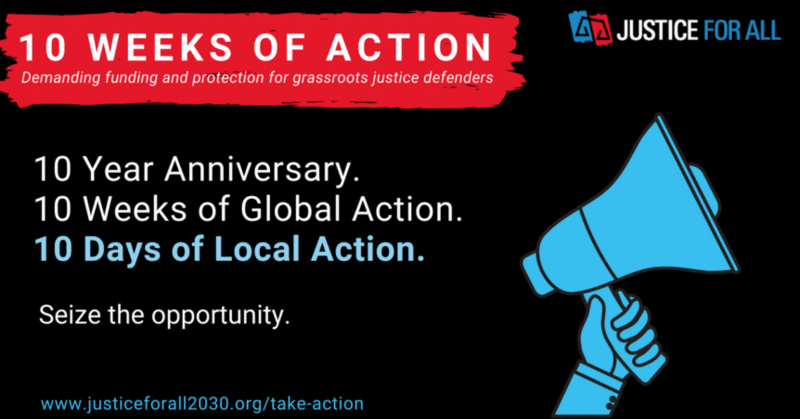 With the attention of world leaders’ trained on the anniversary, we have the chance to spotlight the work of our community from the last decade and highlight the existing gaps around financing and protection for grassroots justice defenders (learn more about the issue here). We need to make it clear that addressing this issue is critical to delivering on the ambitions of the SDGs and ensuring equal access to justice for all by 2030. To do this, we must demonstrate that this global campaign is linked to local issues and efforts. Smart local advocacy leverages global opportunities, as we know that real and lasting change happens at the local level with local action. In the 10 days following this landmark 10th Anniversary, we are mobilising our community to take local action to change the way that leaders deliver on their promise, made at the United Nations, to ensure all people have equal access to justice. We are calling it the “10 Days of Local Action”. The “10 Days of Local Action” will kick off on the 10th anniversary and will run from September 25, 2018 – October 6, 2018. Throughout the 10 days, organisations are encouraged to organise local activities that advance advocacy goals on increasing financing and protection for grassroots justice defenders in their communities, and to work with media partners to spotlight the campaign’s core asks. We encourage you to focus on the most pressing justice issues in your local context. Organise a high-level meeting between civil society and policy makers – civil society can share the forthcoming Justice For All global policy brief, petition and/or relevant national advocacy papers. Convene donor organisations to discuss challenges around financing access to justice and brainstorm ways more financing can be dedicated to grassroots justice defenders in your country. Convene civil society organisations to celebrate the work of grassroots justice defenders, to discuss remaining challenges, and to plan campaign activities to overcome these challenges. Host a public walk to mobilise and celebrate your community and to draw attention to remaining challenges being faced by grassroots justice defenders. Host a press conference or take over a TV show/radio program to discuss the Commission on the Legal Empowerment of the Poor anniversary and share stories of success and challenges being faced by grassroots justice defenders. Take part in the Think Justice consultation, an in-person or online survey to share your recommendations and feed directly into high-level global access to justice discussions. See more about how to get involved in the consultation process here. It’s not too late to tell world leaders to fund and protect justice defenders. On September 25, 2018 – during a high-level event in New York, the Justice For All campaign will deliver the petition to world leaders. If you have not had a chance to do so already, please sign and share the petition now. Grassroots justice defenders work with communities to help them exercise their rights, which in turn promotes citizen engagement and instills a deeper sense of democracy. Unfortunately, funding for the work of grassroots justice defenders is on the decline, and defenders themselves are at-risk of harassment because they are working so closely with communities. This is unacceptable, and it’s time for governments to act and fund and protect grassroots justice defenders working to advance justice for all. 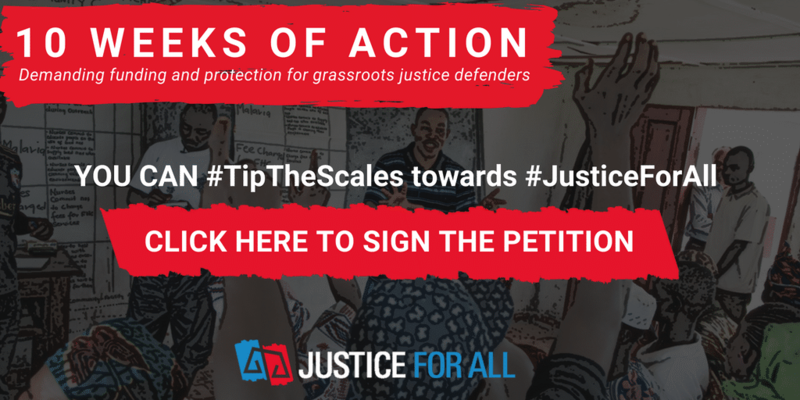 Tell governments it’s time to #TipTheScales towards #JusticeForAll by signing and sharing the petition below. We, the world’s justice defenders and citizens, call on world leaders to keep their promise, made at the United Nations, to ensure all people have equal access to justice. Only by funding and protecting grassroots justice defenders can we make justice, not injustice, the norm. The moment is now. 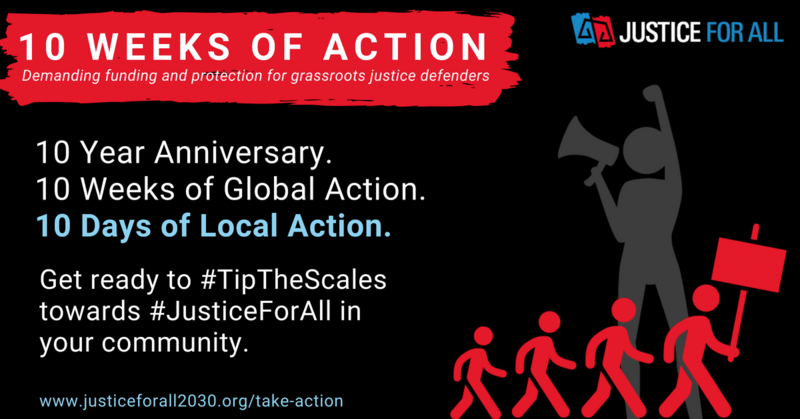 It is time to tip the scales towards #JusticeForAll. The number of signatures will be shared with governments during the UN General Assembly in September 2018. I understand that by signing this pledge I am declaring my support for this issue and allow my signature to be shared with governments of the world.